Before we start our trekking, we have to register ourselves at the Rinjani Trek Center (RTC) 601 m and start trekking to the 1st Post (Bunut Ngengkang) 750 m for about 1 hour. We will take a rest for 5 mins then continue trekking to the 2nd Post (Montong Satas) 1500 m for about 2 hours. At the 2nd Post (Montong Satas) we will take a rest by having a lunch, a hot drink, and fresh fruits. Then we will continue trekking to 3rd Post (Mondokan Lokak) 2000 m for about 2 hours. We will take a rest for 5 mins and then continue walking to Senaru crater rim 2641 m for about 2 hours. 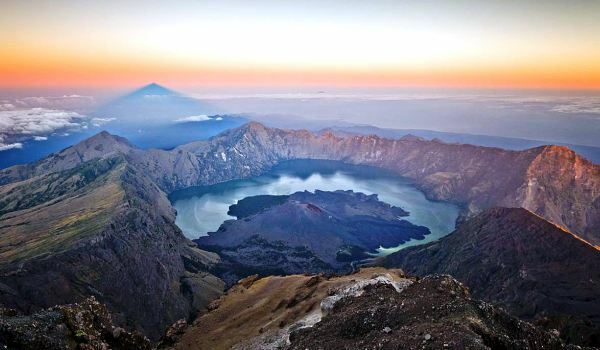 From Senaru crater rim, you can see a spectacular view of Segara Anak Lake, Baby volcano, Mt. Rinjani Summit, Gili Air, Gili Meno, Gili Trawangan, and also Bali. We will enjoy the wonderful sunset and camp overnight here. After having breakfast and enjoying the sunrise, we will walk to Segara Anak Lake 2000 m for about 2 hours. Then we continue walking to the hot spring for a relaxing natural hot spa for only 10 minutes from the lake. After enjoying the hot spring, we will return to the lake and have lunch here while enjoying our afternoon. We will camp overnight here at the lake. After breakfast, we will explore and enjoy our time in the lake. If you like fishing or swimming, you can do it here. After lunch, we will continue trekking to the Sembalun crater rim for about 3 hours. 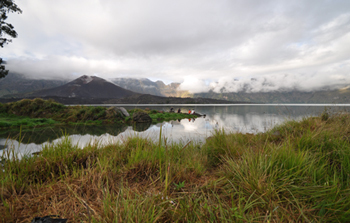 From here we will enjoy the sunset and the incredible view of the Lake, Rinjani summit and Sembalun. We will camp overnight here. We have to wake up at 02:00 AM and have a light breakfast. 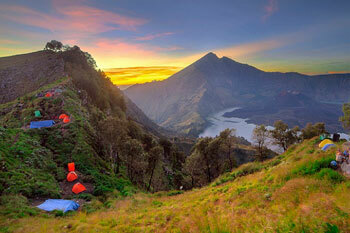 At 03:00 AM, we start trekking to the Rinjani summit (3672 m) for about 3 hours 40 minutes. We can reach the 1st stage which is a moderate climb for 2 hours, while the 2nd stage is a fairly easy but it is a long trek. The last hour is very steep and difficult (there are many loose stones, and as you take two steps forward, you will slip one step back). 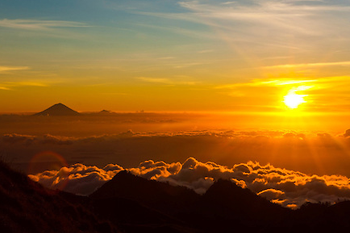 From the Mount Rinjani Summit, you can see Lombok island, Bali, Sumbawa and Segara Anak lake. After sunrise, we will go down to the Sembalun crater rim and have breakfast. After breakfast and a rest, we will continue to go down to Sembalun village and it takes 5 hours to go there, and this is the completion of the trekking program.